Sea ice -- when floating ice melts, does it affect water level? When floating ice melts, does it affect water level? Click on any picture to view a larger version. The blue line is where I marked the container with a Sharpie pen. I put the container of water in the refrigerator overnight, to cool the water, and to ensure that any stretching of the container from the weight of the water would have time to happen before the experiment began. The frosty look is because of condensation on the outside of the container. Seawater contains about 35 g/L of salt, mostly NaCl. When floating ice melts in the lab it has no discernable effect on water level, unless you can make very precise measurements. In the ocean, melting sea ice has no significant effect on coastal sea levels at all. When floating ice melts in the lab, there is one secondary effect which very slightly affects water level: salinity. The mixing of fresh (or nearly fresh) meltwater with sea water reduces its salinity, which reduces its density. The effect is too small to see in my experiment (less than 1 mm of water level change), and not directly applicable to melting sea ice in the ocean. When meltwater from sea ice reduces the salinity of an area of the top layer of the ocean, the "excess" volume of meltwater (the volume beyond that of an equal mass of sea water), or of mixed melt and seawater, rises up, in place, creating a locally elevated sea level, but having no effect at all on sea levels beyond the area of ocean to which the meltwater actually flows/mixes. It doesn't matter whether the water is solid, liquid or slush, nor whether it contains voids/bubbles. Its displacement is the same because its mass is the same, and as long as its density does not exceed the surrounding seawater (which it never will) its varying density has no effect whatsoever on sea level elsewhere. Now, if you do the experiment in a beaker, in the lab, there are important differences from the real ocean. Since the container is small, It takes very little time for the meltwater to mix with and reduce the salinity throughout the beaker. The small size of the beaker means that there's really no such thing as locally elevated sea level unless some of the water is frozen solid; when the water is liquid, it quickly mixes throughout (unlike in the ocean). However, the effect on water density & depth of the change in salinity is still very small. 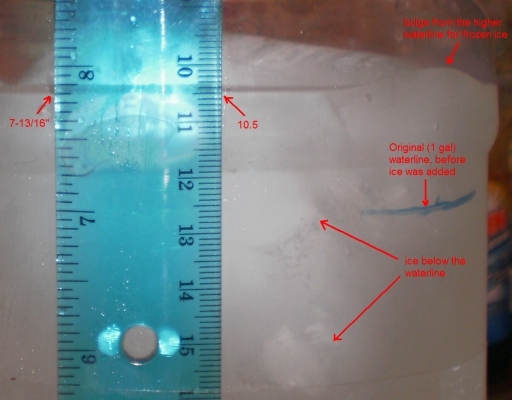 From my experiment you can see that, even in the lab, an amount of ice sufficient to raise the water level by 22 mm when added to the container caused only an imperceptibly small additional increase in the water level by lowering salinity when the ice melted. The effect on water level of adding a quantity of liquid water or (previously-grounded) ice is more than 30 times greater than that of melting the same quantity of already-floating ice. In the ocean, because the reduced salinity from melting sea ice is a local effect, melting sea ice does not affect coastal sea levels at all. Note: Click on any picture on this web page to view a larger version.